Every Christian waits for Christmas season and has come the 2012 Christmas. It is a time to celebrate joyfully and meet our family members, loved ones and friends on this Christmas. What is Christmas means to you? Every individual has different opinions on Christmas and celebrate in different ways. Some people feel happy, some people feel tense and some people do not feel anything. Many people believe that Christmas means the same Christmas that comes and goes every year – meet at a point every year – a cyclic Christmas that meet in the same month and date every year. For many people Christmas means a day of resting from office work, shopping and buying new dresses, having good food, merry making, laughing together with friends. While for some people – it is the same Christmas that was celebrated last year or many years ago – and for some people it is the time of reminiscing of God‘s faithfulness and his gratefulness and they pray and prepare to accept Baby Jesus newly. They not only prepare to meet their family members, loved one and friends but they are spiritually prepared with a grateful heart. Of course, it is like a cyclic event or festival that comes to the same time and month every year. Some years back I was pondering on Christmas and one question came to my mind: why do I have to celebrate this Christmas every year ritually? This Christmas comes every year on 25th Dec. and what is the different with other traditional festival or holiday? Here I realised one thing that Christmas is not just a cyclic event or festival comes every year in the same month and same date and I should not celebrate with such kind of preconception and spirit. But it is a linear Christmas – an event or festival that goes in a straight line. We know that a cyclic line meet at point but a straight line never met at any point, so the past Christmas or last year Christmas won’t be the same as this year Christmas. If we believe that Christmas is like cyclic line or believe in Cyclic Christmas that meets at a point, I think every Christmas that we celebrate will remain the same – it would be just another Christmas or event that comes again at point or time naturally. Christmas comes every year on 25th December, but if we fresh up our mind and heart with prayer and removed our preconception, we can celebrate every Christmas joyfully. Infact, Christmas comes to us every year on 25th December but the same Christmas that we have celebrated 5 years back or one decade ago will no come back to us this year. Today, some people celebrate a cyclic Christmas while other people celebrate a linear Christmas. A cyclic Christmas can be boring too, but we may be able to celebrate joyful in a Linear Christmas that will not come back to us next year. In fact, every Christmas is a new Christmas for us – it is a time to celebrate with our family members, loved ones and friends as we do not know whether we will get another opportunity to live another year or to get the same opportunity next year. In this coming Christmas, I wish and sincerely pray that we have a prayerful heart and celebrate this coming Christmas differently. Every Christmas will remain the same as it comes on the same month and date. But with our prayerful heart, I believe that we can celebrate our Christmas more meaningfully and joyfully with our family members, loved ones and friends. I also pray that we may receive Baby Jesus newly through this Christmas Celebration. Who knows you may be one of the richest and educated men in the town. But you may no know – you are the most unpopular educated or rich man in the town until you over-heard from some one talking in the tea stall. I was shocked to learn that Mr. Shamee John is a very rich and educated person but every one in this town dislikes him. He is such a rich and educated person and I can’t understand why people dislike him in many aspects. Every time he comes to our home town, people talk only his negative aspects; it seems he is the only person in the town who has done nothing good for the town. Why every one in the town does not recognize his riches and high degree that he had earned? We must respect such an educated and rich person in this town. Then I asked him again, “But why you people dislike this particular rich and educated person?” He narrated me further, “You see there are some more rich people like him in our town and most of them invested their money in our home town. But you know this rich chap has not a single penny that has invested in our home town. As we compare to other rich people here, he is richer than any one here in this town. The people in the town want and expect that such kind of rich people to invest some money in our town. They should also contribute their knowledge for their society so that the young generation also may learn from them. But he is good only for himself and for his family. Mr. Kompee James narrated me further, “I have also learnt from some reliable source i.e. from one of his friends in the city that he is also unhelpful to his friends and people around him. If he is not even helpful to his friends and people surrounding him, how can we expect now to contribute his intellects and richness to our society? He has every right to do with his intellects and richness then why are we so disturb and dislike him? He continues to narrate and gave comparison on those people who are not very rich and educated like him and he said that there are some people in the town who are highly esteem for their valuable contribution for the society in the town even though they are no rich and well educated like him. After interacting with Mr. Kompee James, I have many questions that arise in me. Here I came to learn that the people in the town expect every rich and educated people to contribute something good for the society. Many of us may ignore what Mr. Kompee James has narrated to me, but I think we may need to ponder what we are contributing for our society in our town or for our society. Are we educated and rich? If we are not rich like other people in the town, are we educated and knowledgeable person who can contribute something good for the society? If we are not rich and highly educated like others, what we can contribute for our society? In which field we can contribute for our society? Do the people give respect and trust only those people who contribute something beneficial for the society? The question came spontaneously to my mind and I continue to ask many more questions to myself – why the rich and educated people who have not contributed for the society are snubbed in the society? What make the rich and educated people ignore their own society or town? Do we need to contribute something for the society to be recognized by our society? Are we now living in an individualistic society? Why do we need to consider the other persons in the same society or town? I have got many more questions to be asked. When I try to answer some of those questions, I have got some answers but there are many questions that I can’t be answered instantly. So as you read this article, you may continue to raise more questions and ponder yourself and bring the best result for yourself to decide. It is quite inspiring and encouraging when the opposition party under the leadership of Dr.SC Jamir is now leading and working together with the ruling party in Nagaland and supporting the present peace talks in Delhi. If he and his party would have been with the Nagas from before to solve the Naga problem, the process of peace talks in Delhi would have been speed up much faster. However, now as they have joined together in one spirit with same Naga political aspiration, one can have more hope and vision for our future Naga people. It is quite relieving and giving new hope as the Joint Legislators’ Forum (JLF) consisting 60 MLAs went to Delhi to support the peace talks and bringing early solution to the Naga political problem. It is good to learn that the Joint Legislators’ Forum (JLF) is again proposed to visit to Delhi on October 14 to meet Union Home minister in order to bring early solution to the Naga political problem. The opposition parties in Nagaland joining together with the ruling party and underground leaders to solve the Naga political problem have moved a step higher. However, we need one more step to Naga political solution. In this crucial stage of negotiation, every Naga soul needs to support to bring an early solution to the long pending Naga political problem. It is encouraging that Union home minister Sushil Kumar Shinde has talked to the chief ministers of Arunachal and Manipur and trying to reach a consensus with the people in their states. This clearly shows that the GOI is also working to solve this complicated issue. Why Peace-talks are still going on? War is life or death, win or lost in the battle within a week or month. But since we all want peace and a peaceful solution; this peaceful solution through negotiation and dialogue would obviously take time to bring a solution. Nagas have every right to self-determination but it goes through a long procedure to negotiate and dialogue. In the process of peace-talks, some people may loss the hope and patient. But it is worth to wait even more than two decades if we are going to get an honorable solution that will be acceptable to all the Naga people. First, it is a peaceful negotiation and dialogue and not a war and we cannot expect an instant result. The Govt. of India not zealously and sincerely working toward the solution can be one of the main reasons for prolonging the peace-talks. In every negotiation and dialogue, both the parties need to be sincere and faithful otherwise one party cannot make unilateral decision. Second, another problem can be the “Only Expectation” from our leaders without the mass movement and participation from our Naga people. Unless, the whole Nagas move together, the GOI may not consider the issue seriously. Almost all the Nagas are sitting at home comfortably except the Naga civil society leaders. We want sovereignty, we want an honorable solution and we want an early solution sitting at home. But sitting at home and criticizing our leaders may not bring any good fruit. Third, both the GOI and NSCN may be sincere enough in their peace-talks but the issue itself is a complicated issue. Demanding sovereignty or shared sovereignty is a complicate issue. 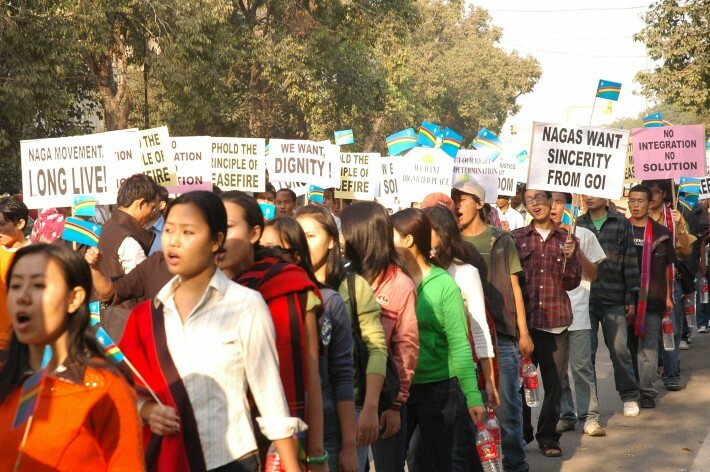 The issue becomes more complicated as the Naga leaders continue to stand on their demands. When we study and analyze the problem and issue more deeply, one can understand why the present peace-talks is dragging on more than a decade. In fact, it is a very complicated issue and one cannot expect to solve the problem within a year or two. Why the GOI-NSCN-IM does not confide the progress of their peace-talks? Yes, every Naga should know what the NSCN-IM is demanding and the progress of their peace-talks with the GOI. But as mentioned above, it is a very complicated issue as it involved some States of India and Mynamar in their peace-talks. As it is observed and have experienced earlier some incidents about the extending of Ceasefire to outside present Nagaland State and the news on Supra-state body, there can be some technical problems to share with the public about the progress of their peace-talks. It is not that only the Naga leaders are not revealing the progress of the peace-talks but the GOI also do not share the progress of their peace-talks in detail. With the GOI keeping the secret of their peace-talks with the NSCN-IM, one may be convinced that it has some technical problem to confide the details of their peace-talks. It is observed and it is quite possible that if the progress of peace-talks is shared with the public in details, there can be more messed within the Naga people and also with the neighboring states. However, the final solution to Naga political problem should be shared, discussed and be acceptable by all the Naga people to bring an everlasting solution. The JLF, Nagaland is on the move, but it seems to be incomplete without joining all the Naga political leaders and other leaders. Why the Naga politicians from Manipur and other States are not joining together with the Joint Legislators’ Forum (JLF), Nagaland? It would be good if our veteran politician Rishang Keishing also become the part of the Naga leaders and support the on-going peace-talks in Delhi to bring early solution of the Naga political solution. A veteran politician like him may be a great influence too if he becomes the part of the Naga leaders and with other Naga leaders. It is time now that we all join together and pressurize the GOI instead of sitting at home and criticizing our leaders for taking so long to bring our Naga political solution. We have read many articles in the paper on our present leaders’ weaknesses, but hardly anyone writes to the GOI and shares our genuine Naga problem or in appreciation of our leaders. It is observed that our neighbor communities have many underground factions too and they may not be better than our Naga underground. But our neighbor intellectuals and writers know the limitation of their underground and give only constructive criticism. Whereas, our Naga intellectual and educated people mostly write only the weaknesses of our leaders without any giving suggestion to improve it. Constructive criticism should be welcomed by our leaders but direct accusation and criticisms lead nowhere except hurting each other and making worse the situation. Now, the only one more steps to Naga political solution may require the Naga mass participation and support, reconciliation and unification of all the Naga factions. Today, every Naga soul needs to support or suggest openly the on-going peace-talks in Delhi to bring an early and honorable solution. If we do not support or give suggestion, and keep waiting for our leaders to negotiate and dialogue – we should be responsible and accept whatever our Naga leaders bring the solution for the Naga people. It is observed that with the mass participation and support, we can have more hope and vision for our future Naga people. Instead of watching and waiting to tell, “My prediction comes true”. It would be better if we all voice together, work together unitedly to bring an honorable solution that will be acceptable by every Naga factions and Naga soul.